with a feel-good live performance by the Merritt Drama Club! Love to Dance Academy has moved! right to the centre of our community. Best wishes and congrats on finding a dance floor the right size! 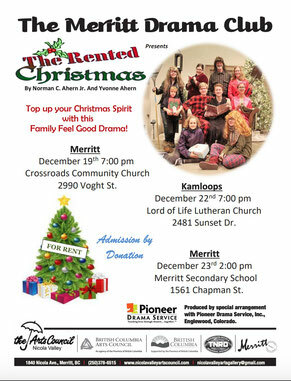 Another Merritt Country Christmas event! Open to LTD students and non-students! "Little Movers" in your area. March 12, 7:00 pm at the NVIT LECTURE THEATRE. “THE GLASS CASTLE” chronicles the adventures of an eccentric, resilient and tight-knit family. It is a remarkable story of unconditional love. Oscar winner Brie Larson brings Jeannette Walls’s best-selling memoir to life as a young woman who, influenced by the joyfully wild nature of her deeply dysfunctional father (Woody Harrelson) found the fiery determination to carve out a successful life on her own terms. Tickets are $5.00 at the Door and Memberships are $2.00. Parking is FREE and there is no food or drink allowed in the theatre. For more info phone 378 3974. 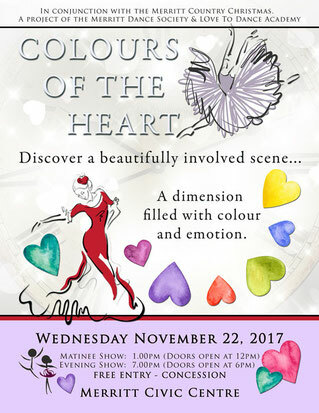 A dimension filled with colour and emotion. 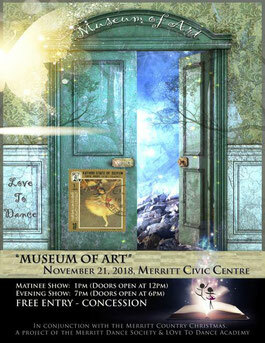 Performances by dancers of all ages. Nicola Valley Film Society presents “TULIPANI: LOVE, HONOUR and a BICYCLE” Rated 14A on Monday, September 17th at 7:00pm at the Merritt Civic Centre. Tickets are $5.00 at the Door and Memberships are $2.00 for the 6 films in the 2018/19 season. Seasons Tickets are available at this screening. For more info phone 250 378 3974. “TULIPANI: LOVE, HONOUR and a BICYCLE” is a cross-cultural, decades spanning, whimsical comedy-drama which takes place in Italy. A young woman, Anna travels from her home in Montreal to Italy upon the dying wish of her late mother. Upon arriving there to scatter her ashes, however, her straightforward trip takes on greater significance and reveals the true history of Anna’s family background. Register now, classes will start week of Sept. 11. Christmas concert practices will start week of Sept. 18. 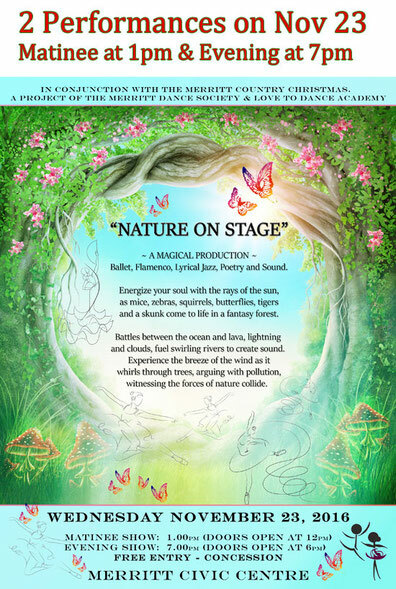 Variety of dance styles to choose from: Ballet, Modern Jazz, Spanish, Latin Line, Country line, Dance movement. Teeny Tots from age 2 years. Stretch & Strengthen for Golden girls, 60+ years. 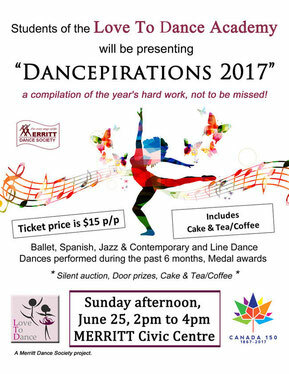 A presentation of the Dance students work from their classes in Ballet, Spanish, Jazz and Contemporary and Line Dance. Enjoy the door prizes, silent auction, and refreshments.